Eric Tachibana thought leaving San Francisco for Asia meant he could not dance swing anymore. But he was wrong. A query sent out through a Northern California swing website came back with a response: there was swing teacher in Singapore and some swing dancers in Pasadena knew her personally. "I contacted the Pasadena Ballroom Association through its website and asked them how I could get hold of this teacher. They sent me her email and the first thing I did when I got there was to give her a call. '', said Tachibana. Like most underground movements, the swing revival started out small, with just a few enthusiasts getting together to learn more about this Harlem street dance which was danced to big band music and jump blues music in the 1930s and 40s. What happened rather coincidentally was that interest in this dance sprang up serendipitously in Sweden, the UK and the US at about the same time, sometime in the late 1980s and early 1990s. By the mid 1990s, the revival was beginning to take hold in the mainstream. The parallel growth of the internet has been an unexpected bonus for this fringe group - it ignited an explosion of some of the most comprehensive websites specially focused on the interests and needs of this fringe group. These sites not only provide information about instruction, location and merchandise in the US, but swing dancers can go as far afield as Sweden, Switzerland, and Australia can find websites that provide local dance information. In the US, one of the most comprehensive sites, the US Swing Dance Server is a vast archive of resources and links that includes animated dance steps; on-line dance classes; and anyone can add to it by emailing webmaster Aswin van den Berg who is based in Ithaca, NY. He put out the call for help to add to the website in November 1994, and has grown to be one of the most accessed swing sites around. In April 1998 it has 11,397 accesses in the week April 21-27 double since March 1997 when it was just under 5000 accesses per week. 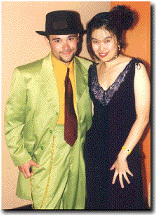 And then there are others - sites like the Northern California Lindy Society even provide fashion information. When Tachibana, a software programmer, arrived in Singapore he volunteered to set up a site for the Singapore swing dance enthusiasts. This site provides news, information and also has a chat room, which attracts discussions as diverse as a California dancer looking for a partner (in Singapore! ), reports on dance camps in the US and even a discussion on the Gap commercial which features swing dancing. "There was no office or coordinator. Everyone pitched in to promote swing in their spare time . We all had full time jobs so I though it was easier to put all the information out there in the web so that anyone could get to it instead of trying ask around and get things like times and places the hard way." , he said. When Tachibana returned to the US, he found that the revival became a country-wide phenomenon in the late year or so, ignited by the Gap commercial which featured this dance in television screens everywhere. He took a road trip across the States and checked out swing clubs starting from Los Angeles, to Dallas, Chicago and even Cleveland before he arrived in New York. He found that most of these swing dance clubs had only sprung up in the last year but was able to find out times and locations by checking into a cyber cafe and doing a quick search. For example, in New York he looked up yehoodi.com which had the additional bonus of rating the quality of clubs in New York. This site was started just in September this year by college student and swing dancer Manu "Spuds" Smith who felt that there was a need to provide a service to New York swing dancers. He decided to set up this web site with his friends Frank and Larry because although there were many good sites providing information they found the system inconvenient. Smith: "When I started dancing, I used the internet to find out everything I could about the Lindy; the steps, the bands and the general buzz of it all. While I was able to find lots of great info, I had to bookmark eight or nine web sites that had bits and pieces of what I was looking for. What I wanted to do was create a swing site that had all of the bits and pieces under one roof. I wanted site that is just as fun for me to visit as all of our regular visitors. Although I'm finding out that it's a bit more difficult than it sounds, I'm pretty confident that Frank, Larry and I are on the right track." It did not take him long to do. He first registered the Yehoodi domain name with Internic, then converted his personal web space to the site, where it is now. 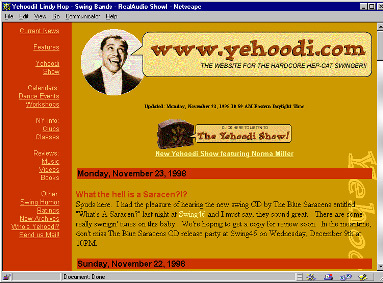 He said: "Yehoodi was really a test to see if people would actually visit and use the site. It has gotten pretty popular so we will probably be looking for some "real" web space soon." The site had about 100 visits in its first week, and rose quickly over the next two weeks to over 300 visits a week. Said Smith: "I feel the web has a great ability to make information easily accessible. Also email has become a terrific resource for getting swingers together. I am on a bunch of swing email lists that inform everyone about what's happening where and when. This allows everyone to keep in touch on a regular basis." Encouraged by the reception of his new site, Smith now has more ambitious plans. He wants to start on a dance steps section using video to teach beginners. He said: "We might piss off a few dance schools here and there, but it is something that I feel should be free. You can learn to dance from a private instructor, a dance school a VHS tape, or Yehoodi, but the key to becoming a great dancer is practice." And a little help from the internet.